Plantar fasciitis is the inflammation, fraying and/or tearing of the plantar fascia, resulting from excessive stress/tension on the tendon. The plantar fascia is a thick fibrous band of tissue that originates at your heel and fans across the bottom of your foot in a V-shape. It maintains the shape of the arch in your foot. Plantar Fasciitis is one of the most common causes of foot pain. It is a painful condition that can strike at any age and linger on for quite some time. Foot Mechanics: Plantar fasciitis is known to affect individuals with both high and low arch profiles. Muscular Factors: Tight calf muscles pull more tension on the heel bone, which strains the plantar fascia. Activities: Prolonged weight bearing is widely suspected to be a major factor in the onset and severity of plantar heel pain. Walking or running up hills and wearing footwear with a soft, flexible forefoot are also suspected causes. Footwear: High heels, worn-out or improper shoes can excessively stress the plantar fascia. Individual: Weight gain and increasing age also place you at a greater risk. Early treatment is essential. You should combine as many treatments as possible for the quickest, most effective recovery. Rest is extremely important. Use pain as your guide: If your feet hurt while standing or walking, limit the time spent on your feet. Ice the area under the heel and arch several times a day—especially after prolonged standing, walking and activity—to reduce inflammation and enable proper healing. A frozen water bottle or reusable gel ice pack is a great way to relieve pain at the end of a long day on your feet. TIPS: Keep a few frozen water bottles handy to use after an activity or work. While sitting on the couch, at your desk or eating a meal at the table, sooth your foot by applying ice under the arch with a frozen water bottle. Gel icepacks can also be used by wrapping it around your foot with tensor bandage for about 5-10 minutes. Remember when using a icepack, to always protect your skin with a layer of clothing or dish towel to prevent an ice burn. Step one foot forward, elevating the forefoot and keeping the heel on the ground. Next, bend the front knee approximately 15 to 20 degrees. Switch to the other leg and repeat. Complete 3 sets of 30 seconds. Stand shoulder-width apart and place one foot ahead of the other. Contract the calf muscle of the back leg to lift the heel. Raise the heel until you have lifted onto the forefoot. Massaging the plantar fascia with a rolling device is a simple treatment option that can be used easily at home. It can help stretch out the plantar fascia, improve blood flow to the area, promote healing and relieve pain. These over-the-counter products will help with healing and pain relief of plantar fasciitis. Use a Foot Rubz Roller 2 – 3 times a day for 2-minute intervals to massage the bottom of your feet. A night splint keeps your foot in a 90-degree position while you sleep. This allows the plantar fascia to heal and recover in an optimal/lengthened position. If you experience pain in your feet each morning, that is one of the best indications that night splints will work for you. Over-the-counter anti-inflammatory cream can be an effective way to temporarily relieve muscle pain. Although this is not a permanent solution, it can be soothing to apply to an inflamed area such as your arch and heel. Foot orthotics are a clinically proven (Gross et al. 2002, Landorf et al. 2006) to improve pain and function in patients with plantar fasciitis through their mechanical support. If you have a flat collapsed arch, an orthotic will help alleviate strain on the plantar fascia by supporting your foot. 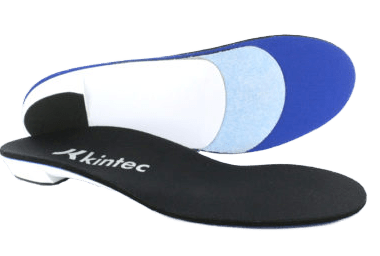 Alternatively, if you have a high rigid arch, an orthotic will distribute the pressure along the bottom of your foot and away from your heel. Learn more about custom orthotics. 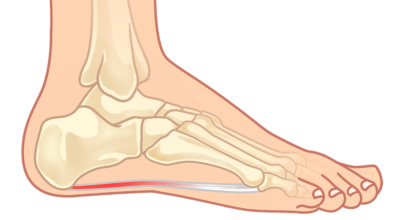 If you have a flexible foot, a structured shoe with torsional stability and a heel counter can help reduce some tension to the plantar fascia. However, if you have a rigid foot, a shoe with good shock absorption can help lessen impact forces to the heel. One of the functions of the plantar fascia is to propel the foot during toe-off. A stiff front rocker can aid in this motion while reducing strain and lessening the workload on the plantar fascia. Tip: When people experience foot pain, they usually look at their work and casual footwear, but not what they wear around the house. Slippers or sandals with built-in arch support are a great option for maintaining arch support.